LOCATION.--Lat 44°11'08", long 75°19'51" referenced to North American Datum of 1983, St. Lawrence County, NY, Hydrologic Unit 04150302, on right bank just downstream from bridge on Osborne Road, 0.5 mi northeast of Geers Corners, 1.5 mi downstream from Big Creek, and 4.0 mi downstream from Harrisville. PERIOD OF RECORD.--July 1916 to current year. REVISIONS HISTORY.--WSP 784: 1934. WDR NY-82-1: Drainage area. GAGE.--Water-stage recorder and crest-stage gage. 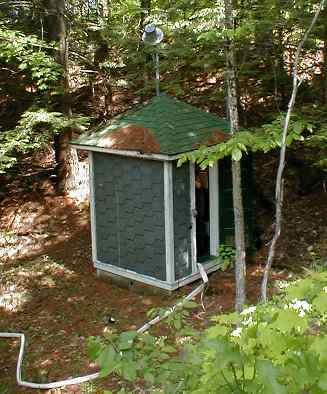 Datum of gage is 738.51 ft above NGVD of 1929 and 737.98 ft above NAVD of 1988 (VERTCON). Prior to Nov. 30, 1933, nonrecording gage at same site and datum. REMARKS.--Since June 1985, extensive diurnal fluctuation and slight regulation caused by powerplant upstream from station. EXTREMES FOR PERIOD OF RECORD.--Maximum discharge, 8,700 ft³/s, Jan. 9, 1998, gage height, 10.64 ft; minimum discharge prior to regulation, 25 ft³/s, Sept. 1, 1934, gage height, 0.86 ft; minimum discharge since regulation, 20 ft³/s, Aug. 11, 1985, gage height, 0.83 ft.